Who says arts festivals belong in the summer? 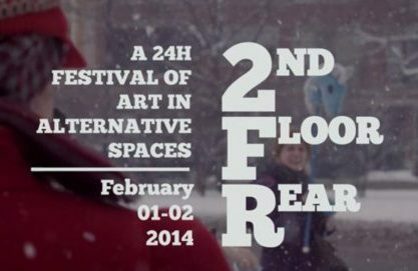 The Chicago arts scene defies subzero temperatures, brought compliments of the so-called “polar vortex,” with 2nd Floor Rear, an annual arts festival running 24 hours straight in the dead of winter. In its third season, the festival took place amidst the big freeze of February starting at noon February 1st to noon the next day, welcoming the audience to be a part of a good, old scavenger hunt-gallery hopping through exhibitions, performances, zine releases, poetry reading and so on, with a map in hand. Adding to the festival’s mysterious nature these kinds of “fly-by-night projects are part of an in-the-know kind of scene, where you have to know somebody to get in, there’s no sign visible from the street, and there’s a slight chance the whole thing was organized by an art school dropout moonlighting as a self-proclaimed DJ,” as Andi Crist of Chicago Artists Resource (So you wanna run an art festival, 2014,) puts it. Exactly. The events took place in the northwest neighbourhoods of Chicago (Wicker Park, Logan Square, Humboldt Park, Avondale) and the alternative spaces ranged from underground apartments, bars, storefronts and hallways, to bathrooms and mini-vans parked on the street –an art crawl to the underfunded and underappreciated. The individually self-produced events started off with a sidewalk parade featuring rock n’ roll marching band “Environmental Encroachment,” that departed the Illinois Centennial Monument on Saturday at noon. Then, doors opened, for free, featuring a little more than 24 hours of DIY extravaganza at some of the most quirky and arty spaces in the city. SAIC’s own Amelia Charter, Alyssa Moxley and Mitsu Salmon welcome their visitors through the garden door entrance, and offer them tea and cookies as they explore a home-gallery of paintings and one-to-one performances. Under Moxley’s sound installations, Charter would give a fifteen-minute performance exploring the human body and its functions in comparison and contrast to the idea and the spaces of home. Her elegantly rhythmical, dance-alike moves and the sounds accompanying her semi-didactic, little speeches so powerfully converted the student home into an art space that it would never be seen the same way again. “The flowers in the field are free,” is according to the artist, Joshua Kent, “a micro-performance and edible installation addressing food systems and the notions and aesthetics of poverty.” The “field” is actually the parking lot located in the corner of California and Armitage and the installations take place in a mini-van packed with flowers and cake where the artist’s true story in first-person narrative, warmed up one of the most dreary winter afternoons. The flowers were free, indeed, in the form of a small pot of purple orchids for everyone. In the afternoon, Logan Square Comfort Station presented High Concepts Laboratories featuring the opening reception of “Nora Nieves and Liz McCarthy: Partitions.” Challenging the boundaries created into the physical world in the form of objects, barriers and frames, the two artists, use mixed media and in many cases bright colours, to create their own frames of the reality we live into, defining the way we experience the spaces around us. Next stop, an apartment conveniently located at Shakespeare Ave that featured Chicago Travelling Theatre Company. “Watch that Clown,” the silent theatrical play showcasing the life of a clown and his dog, balanced among satire, tragedy and uncontrollable laughter all transmitted through muted gestures, mime and, of course, DIY the costumes, make up and background sound. “Live in Zine with Michelle LaPlante,” gave a chance to more than twenty student -and not only, comic artists to market their work. Another SAIC’s own, Surabhi Kanga, was there among others with her delicate and well-thought of piece of work “Snowflakes.” The night ended with comic-jams on a comfy student-apartment couch surrounded by stacks of comics, superheroes from times past, miscellaneous, highly imaginative designs, aperitifs and well, fun. The gallery hopping continued, and the answer to anyone who might wonder how can an art festival run overnight, is one. Performance art slumber party. The festival’s house party attitude turns into a real party, with food and performance from Leah Ransohoff and Alessandra Gomez, going on midnight to 3am. Then the lights are out and the doors are locked. What happens in arts slumber parties, stays in arts slumber parties. Celebrating Chicago’s vibrant communities of DIY artists and spaces, for the third year this February, sure proved that an art festival dedicated to the alternative scene was much needed. The network of participating artists, performers and curators is growing beyond certain neighbourhoods and the audience is ready for an intimacy challenge, exploring strangers’ homes, studios or wherever their art lives. The uniqueness and originality of the artworks brings the city’s new collaborations and its hidden gems to the artistic surface. If art can warm your soul, imagine what 24 hours of arts and crafts interwoven with creativity, playfulness, even with the weirdness and messyness such festivals can carry; can do. Especially in the dead of winter. *In support of 2nd Front Rear running year by year, anyone interested in donating can do so through their Kickstarter campaign.